You could soon get your hands on the self-lacing Nike trainers featured in Back to the Future Part II. Nike designer Tinker Hatfield has confirmed that the company is working hard to launch the trainers in time for Marty McFly's 'arrival' in the future. In Back to the Future Part II, Marty travelled forward in time from 1985 to October 21st 2015. 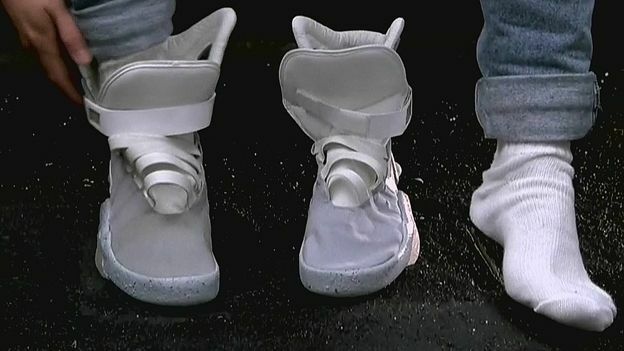 In one scene, Marty is seen putting on self-lacing Nike High Top that automatically adjust to his feet. Speaking to trainer news site Sole Collector, Hatfield said: “Are we going to see power laces in 2015? To that, I say yes!”. Nike applied for a patent covering “automatically lacing trainers” in 2010. In 2011, the company also unveiled a special limited edition Nike Mag trainers, based on the trainers worn by Marty – albeit without the automatic lacing technology. A total of 1,500 pairs were made and auctioned off to raise money for the Michael J Fox Foundation. The auction raised £3.4 million for the charity, whose namesake played Marty McFly in the films and suffers from Parkinson's. His organisation funds research into the disease. It is currently unclear if the self lacing boots will be the same as the High Tops featured in the film. If Nike does launch self lacing boots, expect them to land on October 21st 2015 to tie in with the film.